The new Gaslight District project was announced today at the Dunfield Theatre. The new, $100m+ project looks to entirely remake the Southworks shopping area as well as the old Tiger Brand building. When looking at the plans the gears started spinning in my head of how exactly this was going to match up with the existing structures that currently existed at Southworks. So I was able to whip up this quick comparison to show off the differences. 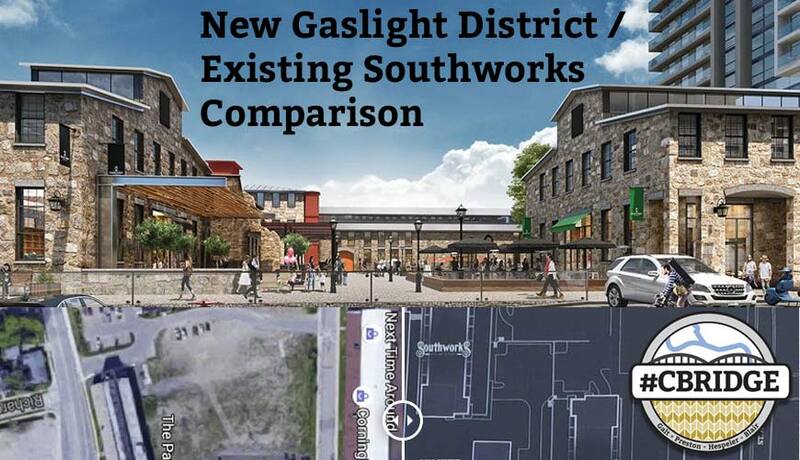 Use the slider in the middle of the image below to compare the new Gaslight District blueprints with the existing area pulled from Google Maps. You can see that the existing outside shopping area is going to be completely removed. It’s unclear if the building at the front will be the existing, or a new structure built in its place. There will be 2 new Southworks building constructed, one right next to the Dunfield Theatre and the other close to the existing indoor shopping area. The indoor area is being completely repurposed for other aspects of the project. This whole exercise was actually very enlightening, as the presentation today was pretty light on actual nuts and bolts of the actual project. I’m sure there will be some in town that won’t be happy to see an old building like that come down as part of this new venture. 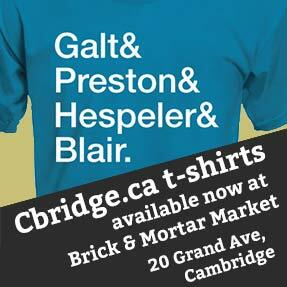 I’ll be writing a more in-depth look at the Gaslight District and what it means for Cambridge in the near future. This is great James! 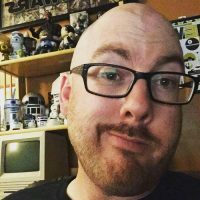 Where did you get the image of the blueprint? I notice that the right edge is cut off. Can you tell me where you got the blueprint so I can look at the entire blueprint? I took a picture of the blueprint at the Gaslight District launch. It was printed out and displayed on the wall. The photo I took was on an angle and ended up stretching it out to proper proportions in Photoshop. I haven’t seen the photo elsewhere on their site either.